At Artichoke, we do not have any commercial affiliations with appliance brands such as La Cornue. We design bespoke kitchens for our clients to a very specific brief, and only during the design process will we consider which are the best tools to help us meet that brief. Our clients place enormous trust in us, and it’s a responsibility we take extremely seriously. Quality of appliances are always at the forefront of our minds when making our suggestions, not just the quality of the build, but in their aesthetic and function. Over the last few years we have seen a growing interest in La Cornue, a French oven company started by an engineer and now run by the founders grandson. 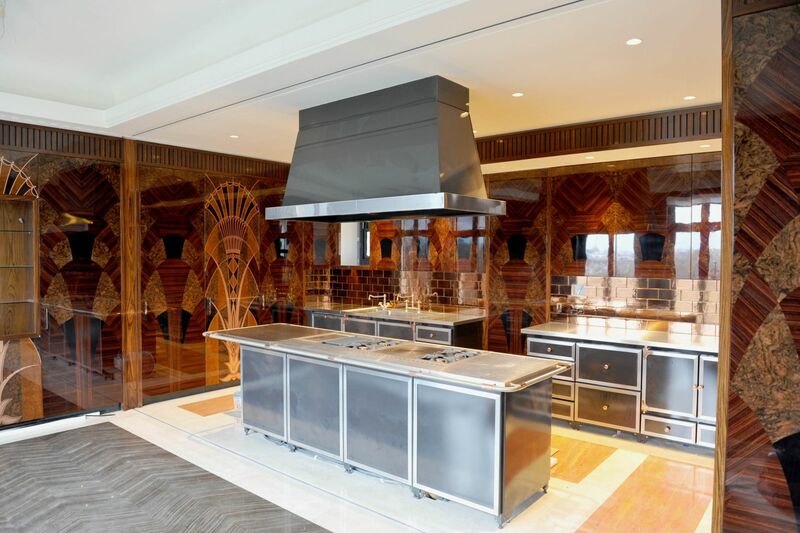 So what is it about La Cornue that seems to be capturing the imagination among buyers of luxury kitchens? Each La Cornue is specific to each customer. They are only produced to order and each one is hand-made. This means the Artichoke design team are able to design the cookers to suit the client’s own specific ways of cooking. It also means we can specify the correct materials to suit the bespoke kitchen’s aesthetic. 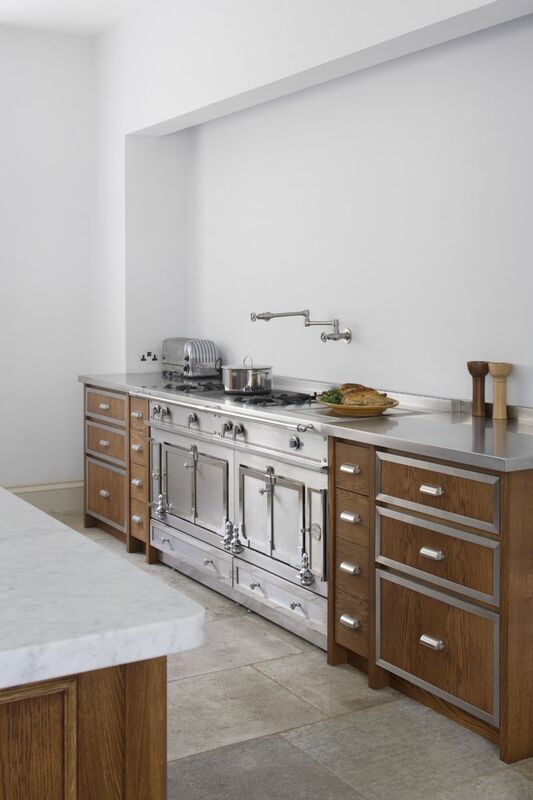 Artichoke designed the La Cornue for the above bespoke kitchen to suit the rest of the detailing in the room. The range was specified in stainless steel with chrome detailing to complement the stainless steel worktops and the burnished nickel kitchen cabinet ironmongery. The La Cornue below is the same model as the one above, but with a completely different look. 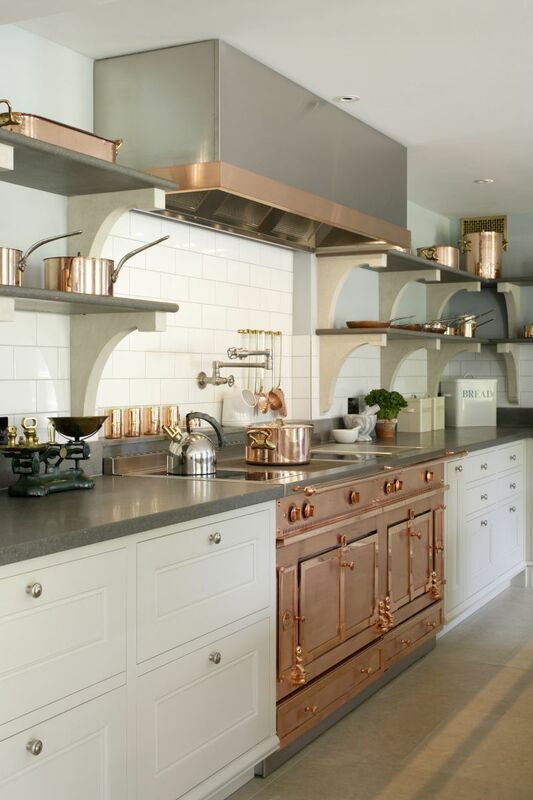 Artichoke designers designed this luxury bespoke cook’s kitchen to evoke the Edwardian back of house kitchen, and the La Cornue range was specified in copper to match the client’s copper pans. Apart from their striking looks, the key feature of the La Cornue is the shape of it’s oven, which has a barel shaped top that creates a natural convection. This, combined with the cast aluminium on the inside of the door maintains the perfect balance of heat and humidity. What this means on a day to day basis is that it takes approximately 2 hours to roast a 20lb turkey and there is no need to turn or baste it while it is cooking. Depending on the type of cooking you enjoy, you may wish to specify one electric and one gas oven. The gas oven is typically a strong, lively heat suitable for roasting meats, poultry and baking bread while the electric oven is a more versatile oven most suitable for baking (pastries) & grilling. At the heart of the top of each La Cornue is the French plaque, sometimes referred to as the Flat Top. The function of the French plaque is to simmer and hold food such as sauces, crèmes, bernaises, chocolates, butter, etc. The plaque is cast iron with a large burner underneath it. The heat is strongest in the center and diffuses and softens out towards the sides, allowing the cook to move their pan wherever they like to get the perfect temperature. The French call this their piano; they move their pots around the plaque like instruments, never altering the heat. Where space and budget allows, it is sometimes worth considering a central La Cornue island. This is something we’ve done on a few occasions for clients and they offer numerous advantages. Firstly, all the ovens and cooking are kept within a single central location, freeing up the rest of the kitchen for scullery and food preparation activities. Secondly, they can look incredibly striking! 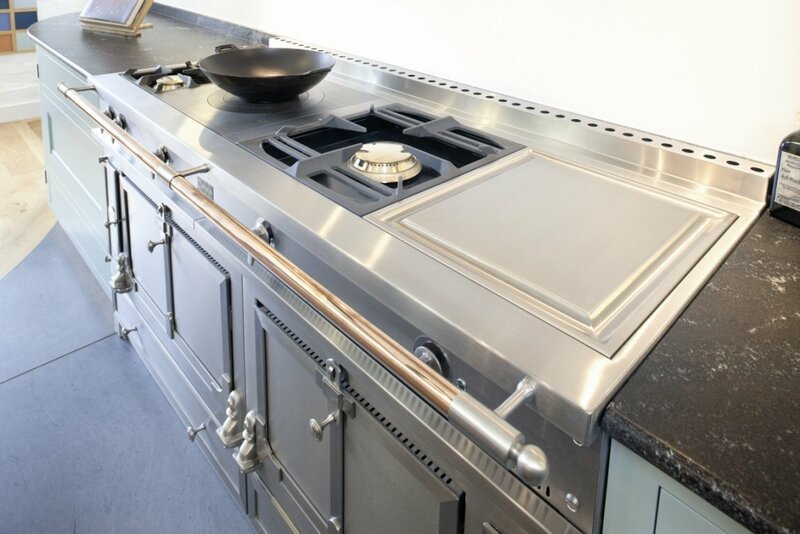 If you are considering a La Cornue for your bespoke kitchen, please feel free to call us (01934 745270). We’d be happy to give you our honest opinion!